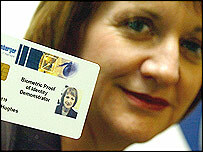 Immigration Minister Beverley Hughes stepped down in the wake of allegations about checks on migrants being waived. Whistleblower Steve Moxon claims key checks were waived at the Sheffield office of the Immigration and Nationality Directorate. 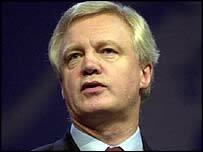 He says the change affected migrants from the eight eastern European countries due to join the EU in May. He claims the idea was to rush through as many applications as possible now to make the numbers coming to Britain less dramatic when the EU expands. He is later suspended and Ms Hughes orders an internal investigation into the claims. Ms Hughes faces resignation calls after admitting in the House of Commons that key checks were waived at Sheffield after a backlog of cases built up. Second whistleblower James Cameron, a senior British diplomat in Bucharest, Romania, e-mails Conservative shadow home secretary David Davis. Mr Cameron says the concerns raised in Sheffield are just the "tip of the iceberg" and concerns are being ignored. Prime Minister Tony Blair rejects Opposition leader Michael Howard's suggestion that he meet Mr Moxon during prime minister's questions, saying he would not be drawn into an internal personnel matter. Pressure grows on Ms Hughes to quit after the Sunday Times publishes leaked e-mails which suggest officials turn a blind eye to bogus students and sham marriage numbers are 10 times the official figure. The Home Office confirms Ms Hughes has approved a fast-track immigration process for thousands of foreigners applying for British passports. The process, designed to clear a 29,000-strong application backlog, was less rigorous than the normal system for granting British citizenship. But the government says many important checks were carried out. Mr Cameron is suspended after being interviewed by the Foreign Office. Beverley Hughes blames immigration managers at Sheffield for an "excess of zeal" for waiving checks on eastern European immigrants. An internal inquiry clears ministers of manipulating immigration figures but highlights deficiencies in the Home Office's Immigration and Nationality Directorate (IND). Mr Moxon calls the inquiry a "whitewash". The Sunday Times prints a leaked memo from senior managers at the IND's offices in Croydon, suggesting a more widespread waiving of checks on those seeking permission to live and/or work in the UK. The Tories seized on the report as evidence that fast-tracking extended way beyond Sheffield and that ministers knew about it but the Home Office says the move is not secret and is in line with past practice. Home Secretary David Blunkett tells the "right-wing press" to forget it if they think they were going to get the "scalp" of Ms Hughes. Mr Blunkett suspends business immigration claims from Romania and Bulgaria while the row is investigated and sets up a whistleblowers' hotline for staff. Ms Hughes rejects calls for her to quit, telling MPs: "I am neither incompetent nor dishonest and I intend to carry on doing my job as long as the prime minister and the home secretary want me to." The Tories publish letters and e-mails showing the Home Office was warned in November 2002 that there was an "organised scam" undermining the system and call a Commons debate on the row. A Downing Street spokesman says she quit after it became clear she had given a misleading impression - albeit unwittingly - to MPs. Work and Pensions Minister Des Browne is appointed as the new immigration minister. Tony Blair chairs top level Downing Street summit on immigration. Attendees include: David Blunkett, Jack Straw, Attorney General Lord Goldsmith, other ministers and representatives from the security services. It is confirmed UK diplomat James Cameron who exposed a series of immigration scams in Romania has been recalled to London. The Tories claim Mr Cameron has been put on final warning for sending details of his concerns to shadow home secretary David Davis. A report by the National Audit Office says thousands of Bulgarians and Romanians were granted British visas even though immigration officials said they should be turned down. The report cites Home Office interference. But the government commissioned Sutton report, published on the same day, clears the government of allegations it had been aware of the scam and failed to act. And it said there was no evidence applications had been waived through to meet asylum targets.